Introducing the All-New Omega B2500 Blender. Omega is a household name in the juicing industry. We are happy they are making a "break" into the world of blenders. If their blenders work anything like their juicers, we are sure to have some real great performers. 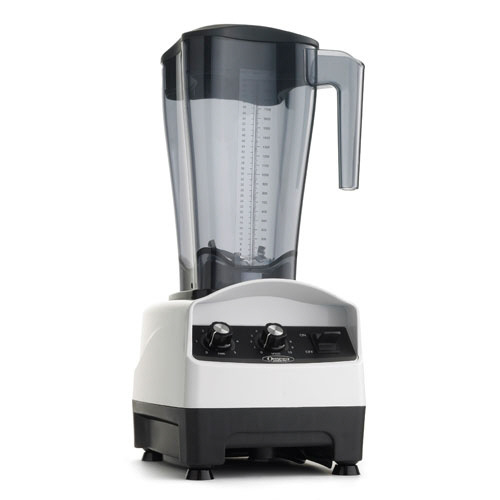 Omega designed and built the B2500 high performance 2 horsepower blender to out perform the competition. The container is uniquely designed to create maximum blending capability and consistent product quality. A wide variety of products can be made with ease with just the touch of a button. Soups, salsas, iced drinks, vegetable and fruit smoothies, in seconds. Of course - it's an Omega! The rugged 2 HP motor provides the power needed to produce high quality drinks and mixes and the uniquely designed container will create maximum blending capability and consistent product quality. A simple and intuitive variable speed control knob allows for infinite and complete control of the Omega B2500. A timer control knob will automatically shut off the blender so you don't have to babysit your blender. Add in features like an unbreakable polycarbonate container, easy grip base, and sound dampening pad, and it is easy to see why this blender is the clear choice for users in bars, restaurants, hotels, juice bars and homes alike. With the 2 year warranty, you can feel confident that you will have a machine that is build to last. 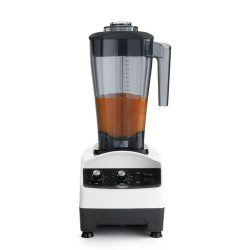 The B2500 motor base houses a rugged 2 horse power motor that is strong enough to blend the most demanding blended drinks, soups, smoothies, salsas and more. The rubber sound dampening pad provides a solid base for the blending container. It also ensures you will have minimal vibration and less noise than other blenders. The one-piece unbreakable polycarbonate container featuring a molded handle and easy-to-remove two part lid makes clean-up a breeze. The durable stainless steel blade assembly with precise angles runs at speeds up to 23,500 revolutions per minute to ensure a consistant blend every time. What's the difference between the Omega B2300,B2400 & B2500 blenders? The only difference between the B2500 and B2500L is the carafe that is included with the unit. The B2500 includes the standard 64 ounce carafe while the B2500L includes the large 82 ounce carafe. The main differences between the models are the user controls. All the blenders contain the same, powerful 2hp motor. The picture below shows the control panel of the B2500. Need further information about this product? Click here to view the manual or instructions for this juicer. Powerful: The unique and powerful 2 horsepower motor provides exceptional performance and reduces down time. Versatile: The powerful 2 horse power motor lets you blend virtually anything that you may need. From salsas, fruits, soups and even ice for great frozen drinks, you can do it all in the Omega B2500 blender.